Guatemalan Spanish (Spanish: Español guatemalteco) is the national variant of Spanish spoken in the Central American country of Guatemala. About 13.7 million of the 16 million population speak Spanish. It includes the use of the second-person singular personal pronoun vos alongside the standard Spanish second-person singular pronouns tú and usted to form a three-level system of second-person singular address. The presence of Seseo wherein there is no distinction between /θ/ and /s/. Seseo is common to Andalusian and Canarian Spanish varieties. /x/ is realized as glottal [h]. The pronunciation of intervocalic /ʝ/ (orthographic y or ll) is "weak", without friction. There is no confusion between /l/ and /r/, as in the Caribbean. Word-final /n/ is pronounced velar [ŋ]. As Guatemala was part of First Mexican Empire, Guatemalan dialect adopted the voiceless alveolar affricate [t͡s] and the cluster [tl] (originally /tɬ/) represented by the respective digraphs <tz> and <tl> in loanwords of Nahuatl origin, quetzal and tlapalería [t͡ɬapaleˈɾia] ('hardware store'). Even words of Greek and Latin origin with <tl>, such as Atlántico and atleta, are pronounced with the affricate: [aˈtlãn̪t̪iko̞], [aˈtle̞t̪a] (compare [aðˈlãn̪t̪iko̞], [aðˈle̞t̪a] in Spain and other dialects in Hispanic America). There are also many words unique to Central America, for example, chunche or chochadas or babosadas means "thing" or stuff in some places. The words used to describe children (or kids) vary among the countries in Central America; in Guatemala they are often called patojos. Cipotes is also used in Guatemala in the eastern departments. In the western and northern departments of Guatemala "chamacos" is used to say children or kids. In Guatemala and Honduras the word güiros is also used. In Guatemala (also in Honduras and El Salvador) people with money are said to have pisto, a term originally used by Maya peoples in Guatemala. ^ Pinkerton 1986, p. 690. ^ a b c D. Lincoln Canfield, Spanish Pronunciation in the Americas (University of Chicago Press, 1981), pp. 65-66. ^ a b c John M. Lipski, Latin American Spanish (Longman, 1994), pp. 290-291. Acevedo-Halvick, Ana (June 2006). 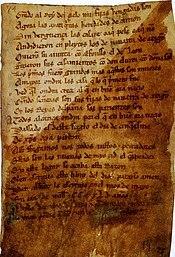 "Cortesía verbal (introducción)" (PDF). Voces. Universidad Rafael Landívar. 1: 21–71. Pinkerton, Anne (September 1986). "Observations on the Tu/Vos Option in Guatemalan Ladino Spanish". Hispania. American Association of Teachers of Spanish and Portuguese. 69 (3): 690–698. doi:10.2307/342783. Predmore, Richard L. (1952). "El sufijo-al en el español de Guatemala" (PDF). Nueva Revista de Filología Hispánica. 6 (2): 140–144. Retrieved 2010-05-04. Toursinov, Antón (2001). "Lexical peculiarities of Guatemalan national variant of Spanish" (PDF). Intercultural Communication. Chelyabinsk State University: 143–150. Toursinov, Antón (October 2002). "Stylistic variability of pronoun addresses in modern Spanish of Guatemala". Language and Literature. Tyumen State University. 17 (3). Utgård, Katrine (2006). Fonética del español de Guatemala Análisis geolingüístico pluridimensional (MA thesis) (PDF). University of Bergen. This page was last edited on 28 November 2018, at 00:12 (UTC).